India continues its winning journey in champions trophy 2013 as it beaten Pakistan in its third group match by 8 wickets. 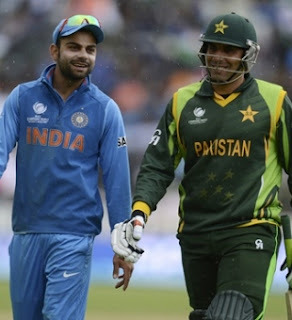 it was one of the most boring match ever played between Pakistan and India. the match was interrupted by rain again and again. Indian captain MS Dhoni won the toss and decided to bowl first. Pakistani Batsmen once again failed and and got all out after scoring just 165 runs in 39.4 overs. the match was stopped 4 times due to rain and overs were also reduced according to D/L method. Indian bowlers specially R Jadeja and B Kumar bowled very well. they got 2 wickets each. India got the target of 102 runs in 22 overs according to D/L method which they got in 19.1 overs for the loss of 2 wickets. S Dhawan once again played well and scored 48 runs on just 41 balls. Pakistan lost all the three group matches in champions trophy due to poor batting. In three matches totals of Pakistan were 170, 167 and 165. Pakistani time will now go back home and Indian team will play Semi Final of Champions trophy 2013.